SAN IGNACIO TOWN, CAYO, Sun. Sept. 13, 2015–On Friday night, September 11, Christian Ambassadors defeated Black Hawks in the U-19 division by the score of 46-29. Shaquille Crawford had the game high with 12 points for Christian Ambassadors, while Antuane McFadzen netted 11 points. In a losing effort, Black Hawks was led by Kyron Molina with 10 pts, and Justin Ford with 9 pts. Game 2 saw Yabra blowing out Invaders in the Over 35 division, 71-27. Yabra was led by Vince “Postman” Estrada, who had the game high with 18 pts, while Bart Sanchez finished with 15 pts, and Kevin Domingo and Cassian “Russian” Flowers scored 13 and 10 pts, respectively. The top scorers for Invaders were Gerald Hewlett with 11 pts and Dylon Ayuso with 9 pts. In the nightcap, the home team, Falcon Ballers was able to narrowly hold off RCV Stallions in the senior division by the score of 57-46. Falcon Ballers was led by Anfernee Young, who scored 15 pts, while the top scorers for RCV Stallions were David Hyde with 14 pts, Mark Gentle with 11 pts, and Frederick Banner with 8 pts. On Saturday night, Belmopan Shock remained undefeated in the tournament, easily defeating SHC, 49-6, in the female division. Belmopan was led by Enid Dakers and Kaylani Reid, who netted 18 pts each. SHC’s scorers were Lucia Tesecum, Nina Awe and Cheyenne Brooks with a basket each. In game 2, both Under 23 teams played their first game of the season, as Santiago Juan Warriors edged Spartans, 41-39, in overtime. Santiago Juan Warriors was led by Elvert Ariola with 16 pts, while Jeffrey “Turtle” Carillo sank 10 pts, and Nigel Daly hit the winning three-point shot, as time expired. In a losing effort, Spartans’ top scorer was Kevin Brown with 13 pts, while Vijan “Patch” Scott and Elvin Garcia netted 11 and 10 pts, respectively. The seniors then battled in game 3, as Panthers narrowly defeated Tuff Enuff by the score of 70-66. Panthers’ top scorers were Trevaughn Usher and Daniel “Buddy” Nolberto, who sank 20 pts apiece, while Johan “Cutto” Bermudez chipped in 10 pts. In a losing effort, Tuff Enuff was led by Andrew “Bynum” Ortiz with 18 pts, and Stanley Thomas with 13 pts. Sunday afternoon saw SHC U-19 boys being defeated by Alpha Warriors, 61-54. Alpha Warriors’ top scorer was Joel Montejo with the game high 27 pts, while Shevan Harris scored 14 pts. SHC was led by Raheem Crawford with 17 pts and Orel Neal with 10 pts. In game 2, Eagles defeated Roaring Creek Effects by forfeit in the Over 35 division, as Roaring Creek was a no-show for the game. 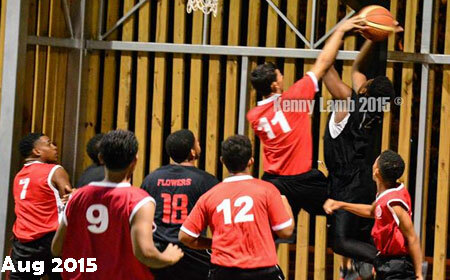 The last game of the weekend was in the senior division, as Snipers defeated Benque Power by the score of 85-72. Snipers, was led by Emerson King, who sank 28 pts, and Elroy “Shabba” Willis finished the game with 13 pts. Roberto “Mosho” Castellanos was the top scorer for Benque Power with 26 pts, while Ivan Flowers scored 19 pts.